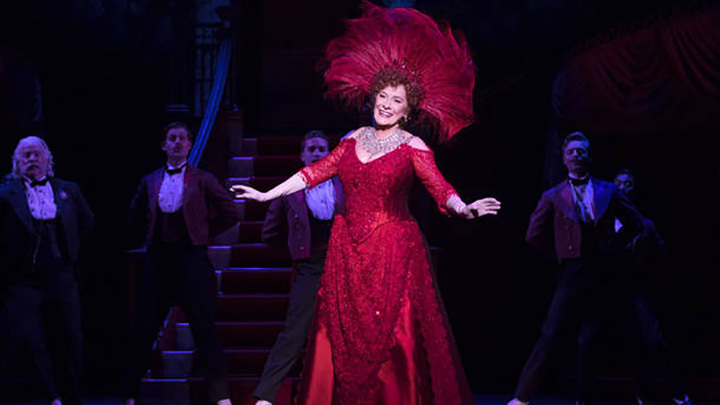 If you are the type of theatre goer who demands of each performance the absolute best in story line, performance, undeniable music, riveting stagecraft, abundant humor and pure nonstop entertainment then you need to get over to the Hollywood Pantages Theatre right now and enjoy Hello Dolly. It truly is one of the very best of the best in musical theatre, led by the utterly captivating Betty Buckley as the irrepressible, somewhat devious yet totally loveable Dolly Gallagher Levi. When Hello Dolly first opened on Broadway in 1964.Dolly was played by the amazing Carol Channing. A little later the awesome Mary Martin played Dolly on New York’s West End and then in 1969 a film version of the story was made starring Barbra Streisand. Two other Broadway stars, Pearl Bailey and Bette Midler have also taken that leading role. So when Betty Buckley stepped up she had some mighty big shoes to fill and she has done so flawlessly. And now for my confession. When I went to see Hello Dollyat the Hollywood Pantages my expectations were low. I had never seen the show before which was a bit unusual, but there was just something about just the name of the show that left me with at least a smidgen of doubt. All of that was totally erased about half way through Act One resulting in my leaving the theatre filled with happiness and positive energy. But also by the end of Act One there were many questions still unresolved. Horace Vandergelder [Lewis J. Stadlen] is a wealthy “half millionaire” business owner from Yonkers in pursuit of a marriage to a woman arranged by Dolly. They are to meet in New York City. Horace seeks the marriage because he feels he needs a woman to clean his home and business. Horace is also a brutal businessman with two young men working for him. When Horace announces he is leaving for New York City he tells them they must stay at work all day every day in his absence. But shortly after Horace leaves for the train station the two young men decide that they too shall go to New York City and for the very first time in their lives actually kiss a woman. Now I get it, this sounds more than just a little over the top and in our modern world it surely is more than just a little weird. But the time frame of the show is in the late 19thcentury. Societal norms were different then and it is all played out so beautifully it is both believable and totally enjoyable. Once all of the principal characters are in New York City the action gets very interesting very fast. The two young men from Yonkers find themselves in a hat shop run by a woman. A fascinating conversation ensues when suddenly Horace Vanderelder arrives forcing the two young men to hide, lest they be caught having abandoned the store. It is very funny but even more compelling to my eyes was amazing exhibition of choreography as the two young dash and dance about in their efforts to avoid detection. It emerges along the way that while Dolly is supposed to be acting as a matchmaker for Horace and others she has a much different plan in play. It seems that the one match Dolly really wants to make is herself with one of her unsuspecting clients. The two young men have their own dilemma. They very much want to take the ladies out for an elegant meal at one of New York City’s most refinedt restaurants. The problem is they have less than one dollar with them and that is not nearly enough not even in 1896. Will the young men get their kiss? Will Horace marry the woman Dolly hooked him up with? Oh and along the way the whole gang ends up before a judge facing criminal charges. What will happen then? These are but some of the dramatic twists and turns that spin along delivering total entertainment in Hello Dolly. This is absolutely a do not miss experience. One final note: the time is 1896 and the costumes, music and dancing are all fascinating and period perfect. Just one more element to embraces and enjoy. The Hollywood Pantages Theatre is located at: 6233 Hollywood Boulevard, Los Angeles, California 90038. Hello Dolly (music and lyrics by Jerry Herman, book by Michael Stewart) will be there now through February 17, 2019. The easiest way to make reservations and purchase tickets is by visiting their website. Looking for a great read? Look here.